What is a top 1% user in a tag? Update: The criteria described here have now been implemented in the Developer Story. The old CV calculated those numbers with respect to all Careers users. In other words, "Top 20% for jQuery" means among people who are active in the jQuery tag and have a CV, you're among the top fifth. Now that the Developer Story is on Stack Overflow, we started calculating the percentiles with respect to all Stack Overflow users active in the tag. This caused a pretty big change in the values, because the number of users we compare you to is much larger, with a long tail of users who may just have very few answers (or none at all, because right now we compare you to everyone who has ever answered or asked a question in the tag). Now, the CV numbers always seemed too unfavorable; comparing you to the rather arbitrary group of people who have a CV does not seem appropriate for a number that's supposed to showcase that your Stack Overflow activity in a particular tag is noteworthy. On the other hand, the new numbers certainly seem inflationary, so we think that the good values are somewhere in between. So the question is, who is a top 10% contributor to the Ruby tag? What does it mean to be more prolific in PHP than 99% of the other contributors? Or, using the words of the tooltip, what is a "Stack Overflow answerer on C#"? Let's look at data. 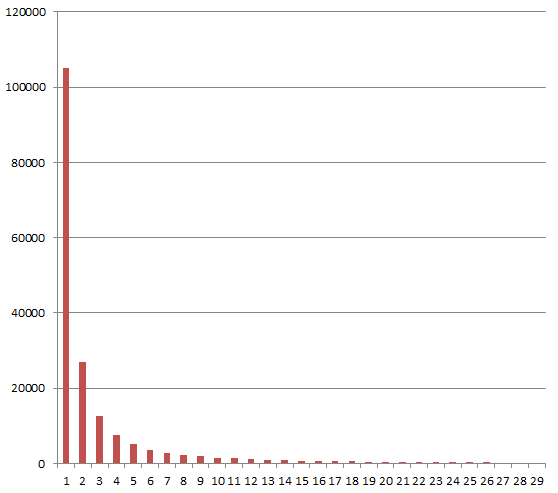 The following is a pretty typical graph (in this case it's the one for the android tag, but it looks similar for other tags) that shows the number of users that have a certain amount of answers in the tag. So 105k users have one Android answer, 27k have two, etc. As you can see, there's a sharp drop-off between 1 and 2, but the subsequent cliffs aren't as steep by far. So there's a huge amount of users with one answer (drive-by answers? only-ever answers? answers where the question happened to have the tag but the topic was mostly about something else? ), but starting at 2 it looks much more normal. This makes me think that we should consider a user a contributor to the tag, an "answerer", if they have posted at least two answers. I have created a test page where you can enter a Stack Overflow user's profile URL, and that shows the top X% values under the CV logic, the current Developer Story logic, and my suggested new logic. Please try it out by entering your (or someone else's) profile URL, check whether you feel that the new logic seems to fairly evaulate the user(s), and post any thoughts you have as answers here. Browse other questions tagged discussion developer-story . How does “TOP 10%” work in the Developer Story? Is there a minimum number of questions before tag top percentage badges appear on the developer story?